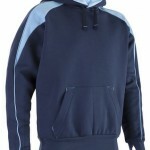 We were sourcing some hoodies for Blandford RFC and came across this one from Chadwick Textiles. It has contrast panels down each side, thumbholes in the cuffs an ipod chord channel and heavy draw cords. Overall it is very well made and everyone who has seen it thinks it is wonderful. Available in sizes from a small child to 3XL and 7 colour combinations it is great for sports teams and clubs. Date posted: November 8, 2015	| Author: Salix	| Comments Off on Probably the best hoodie we have seen!